The transfers for this release came from the collection of Edward Johnson, to whom I am once more grateful. The Franck dates from Paray's first recording sessions for Mercury with the Detroit Symphony and were made in a busy week which yeilded some four LPs of release material - a remarkable and enthusiastic work rate for any orchestra and conductor! Paray of course excelled in French repertoire, and this is evident throughout this collection. Mercury's sound, once XR-remastered, loses the boxiness of the Franck and over-emphasised mid-range of the rest, and remains good throughout, with superb extension both in the very deep bass (listen to the percussion in the Chabrier) and at the top end, though it is perhaps a little more hissy in the 1955 recordings than the 1953. Great care has been taken in the pitching of the recordings and the elimination or reduction of wow and flutter. The 1953 LP was somewhat sharper than the concert pitch of the 1955 and this too has been fixed. This is a very good performance and recording indeed and there is almost nothing one wants to cavil at. Paray is ideally suited to the work, as one would expect, and in his admirable reading I only question one accelerando in the first movement (after letter L in the score), simply because it is too short a passage and the accelerando seems to lead nowhere: and perhaps the slower wind interpolations in the middle movement (after letter 0) are rather overdone for a pia lento that need only be poco, as marked. I cannot imagine that this record will disappoint anyone, for it is a finely judged performance, recorded with both clarity and warmth. I would put it at the head of all earlier versions. I must just advise the reader, however, that there is one much cheaper disc among those listed above, the 10-inch Philips ABR4048, and it is by no means to be overlooked. Its main defect is a very " empty hail" acoustic but that apart, its sound is good and Ormandy directs a sympathetic performance. I do far prefer both Paray and Mercury's sound—but it does cost more. I really feel that I was hearing this beloved recording for the first time. And I am captivated by it. Can a mere remastering of a favorite recording leave you in tears? In my case, with Andrew Rose’s version of Paul Paray’s 1953 Franck Symphony, the answer is yes. I first read about this performance in Martin Bookspan’s volume on recordings of the standard repertoire, where he contrasted it with Furtwängler’s nearly contemporaneous, moodier version. I was intrigued, but where was a high-school student in Wayne, New Jersey, in the 1970s to locate a copy? Lo and behold, one day the discontinued Mercury Wing LP reissue showed up in a bargain bin at the local Kmart. I’ve never looked back where the Franck is concerned. This is the finest version of the Symphony that I know of, going back to Stokowski’s 78s, which I once owned. What Andrew Rose has done with the sound is wonderful. My LP has lots of sonic impact, but it is pitched rather sharp and displays the orchestra with a somewhat acidic quality. Rose has corrected the pitch and allowed for a far more realistic dynamic range across the frequency response. Balances are better, details are thrown into meticulous relief, and overall the orchestral color is more appealing. I really feel that I was hearing this beloved recording for the first time. And I am captivated by it. Years ago at Tanglewood, Joseph Silverstein and André Previn were rehearsing Franck’s Violin Sonata, when Previn said he couldn’t stand the religiosity of Franck’s Symphony. Silverstein replied that when it is played straightforwardly, without affectation, it is a very appealing piece. That essentially is the approach Paray takes. Not that there isn’t a fair amount of flexibility. Paray’s reading in its way remains religious, containing that lyrical French religiosity exemplified by Fauré. The wonderful Detroit brass, in particular, help to establish the sonority of a 19th-century French organ, with all the religious feeling that conveys. As the piece begins, Paray captures Franck’s evocation of the opening of Liszt’s Les Préludes, which Paray recorded beautifully, too. The Lento builds up with a steady inevitability. In the main section (and throughout the symphony), Paray gets a true legato from the strings, employing rubato subtly. This reminds me that two conductors Paray said were “good” for him were Schuricht and Barbirolli—both of whom could get a lyrical feeling from an orchestra. The movement’s big moments have the quality of an organ improvisation, with apocalyptic overtones. The next movement is taken at a true allegretto, rather than being a slow movement. The first chairs shine, and Paray brings out a wealth of detail without any fussiness. The last movement is not rushed; Paray constructs its chords beautifully. The brass possess an authentic Gallic sound we no longer hear. This recording simply is a classic. 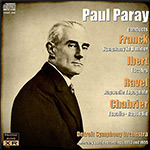 Considering the Ibert and Ravel, I have on hand the CD of Paray’s 1962 stereo remakes of these works. The earlier 1955 performances are superior. While the 1962 renditions were captured on 35mm film and have a superior fleshy impact, the single-microphone 1955 monaural sound is better balanced and feels more musical. In Escales, Paray used slightly broader tempos in its outer movements in 1955, to splendid effect. In the first movement, the Detroit strings play with graciousness worthy of Beecham. Paray employs a wide dynamic range soaked through with color. An earthy, unhackneyed Arabian scene follows in the next movement. For “Valencia,” Paray’s spacious tempo allows all the festive sounds to come through without caricature. The Ravel opens at a sultry evening rich in possibilities. The dance rhythms of the following Malagueña possess snap without haste. An indigenous elegance informs the Habanera. In the concluding “Feria,” elements of the entire scene appear subtly, then coalesce. The Moorish element in the second section is richly evoked. This is distinctive Ravel. Lastly, Chabrier’s España gets a brilliantly virtuosic performance, with its tricky rhythms always lucid. It comes from the same session as the Ibert and Ravel but is better engineered; did the Mercury team move the microphone, or did the orchestra’s seating arrangement change? Perhaps this simply is a mastering issue with the LP source Andrew Rose used. I regret that I do not have Paray’s stereo versions of the Franck and Chabrier on hand for comparison. If you are looking for stereo recordings of this repertoire, I would recommend Pierre Monteux or Andrew Davis in the Franck, Leopold Stokowski in the Ibert, Yan Pascal Tortelier in the Ravel, and Eugene Ormandy in the Chabrier. But anyone who loves Franck’s Symphony will want to hear Andrew Rose’s CD. Harold Gomberg, longtime principal oboe of the New York Philharmonic, listed Paray among the five best conductors he ever played for. This CD will leave you in no doubt why. This article originally appeared in Issue 36:2 (Nov/Dec 2012) of Fanfare Magazine.